Holding law degrees in both the United States and Ireland, Aidan focuses on foreign direct investment matters, providing business, agency and project development services in the United States and Europe. He is a Fellow of the Smurfit Graduate School of Business at University College Dublin and Founding member of their North American Board. 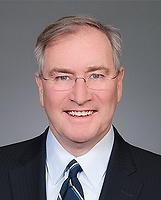 Since his move to the United States in 1986, Aidan has assisted hundreds of companies in the United States, Ireland and the European Union, including banks, real estate investors, life sciences and technology venture capital firms and service and technology companies, particularly those looking to establish and be capitalized in the United States. His clients also include numerous high net worth individuals and world-class athletes. In addition, Aidan has assisted Canadian and American companies with public procurement projects in Ireland. The majority of Aidan’s clients are serviced by Sullivan & Worcester’s real estate, tax, corporate and litigation practice areas. Aidan has served as a foreign direct investment consultant to Ireland’s leading law firm, A&L Goodbody, for over 25 years. In this role, he has assisted American corporations as they enter Ireland and the EU. He also serves on several advisory boards, including The Cashman Group, Patriot Renewables, Connelly Partners, PEC, Inc. and The Irish American Partnership. He is also the Chairman of the Boston Friends of the Gaelic Players Association.